With support from the National Science Foundation (NSF), scientists at Emory and Georgia Tech, Northwestern and the University of Chicago will use advanced “machine learning” techniques to decode the complex languages of the nervous system. The NSF has awarded a team of researchers $1 million over three years to understand how networks of neurons work together to perceive the world and to generate the control signals needed to produce coordinated movement. Their project is titled "Discovering dynamics in massive-scale neural datasets using machine learning." 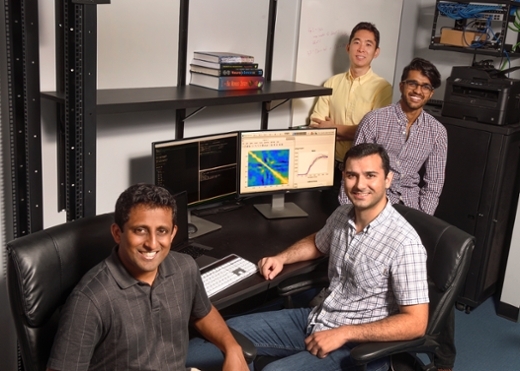 The team includes Chethan Pandarinath, PhD, in the Wallace H. Coulter Department of Biomedical Engineering at Georgia Tech and Emory University; Lee Miller, PhD at Northwestern; and Matthew Kaufman, PhD at the University of Chicago. Conventional neuroscientific experiments monitor the activity of just a small fraction of the neurons in any given brain area, and for just a few hours. Here the scientists anticipate being able to create massive datasets using new brain-interfacing technologies. In one set of studies, they aim to monitor much larger numbers of neurons -- up to 10,000 neurons at a time -- using two-photon imaging techniques. In another, the team will monitor for much longer time periods -- over the course of many weeks to months -- as animals go about normal, natural behaviors. However, collecting the data is just half the challenge. Being able to analyze and interpret such massive datasets requires innovative new algorithms, which build on "deep learning"-based techniques recently developed in Pandarinath's Systems Neural Engineering Lab. Analyzing the data will guide engineers in developing technologies that could help paralyzed people move their limbs, or improve the treatment of people with Parkinson’s and other diseases via deep brain stimulation, Pandarinath says. The award is one of 18 NSF-supported grants announced this week, which are part of the federal government’s Brain Research through Advancing Innovative Neurotechnologies (BRAIN) initiative.